We have all been there. We registered for the test, bought a practice book and maybe even enrolled in a course to help us get to our goal score. With a bunch of post-it notes, highlighters, and the best intentions, we felt confident that we would succeed. Opening up our planners, we diligently wrote in the number of chapters we would read per day or the number of hours we would spend per week to get to our goal. And then we never open up our planners again. Has this happened to you? I feel like everyone has experienced this at one time or another. Initially, we have so much motivation, but for many students, our plans get derailed before we even begin. I know that right now, you feel inspired to do your best, and that is great, but if you fool yourself into thinking that you will actually write 4 practice essays and learn 200 vocabulary words every day, you are setting yourself up for failure. You will quickly be discouraged because you did not give yourself a reasonable amount of work to get through. Each student is different, but if you are already a full-time student or have a full-time job, it is nearly impossible to think that you will be able to balance that and studying for the TOEFL for nearly 5 hours per day. Instead, scale back the amount of work you self-assign. Could you write 4 practice essays in a week’s time, alternating the days when you try an independent and an integrated essay? This means you are planning to write for roughly half an hour, 4 days in the week, leaving you one weekday free. This is much more reasonable, and with this practical plan, you are much more likely to stay on track. When I asked for their goal scores, so many students responded with “I want to get a 120.” It is great to have high goals, but a perfect score on the TOEFL is simply not something that happens frequently, even for a native speaker, as you can see in this post from Strictly English’s experiment. In a report released by ETS, the average score for students applying to college last year was a 76— which makes perfect sense, as scores of 75-80 are often listed as the minimum score for entrance into undergraduate programs in the U.S.; the average score for graduate school applicants who took the TOEFL in 2014 was just an 84. Don’t believe me? Check out the report right here. In other words, don’t simply decide that you need to get a 120. Even if you score above average, you might still feel disappointed if you set your sights unrealistically— and unnecessarily— high. Only the top 2% of all test-takers scored a 116 or above last year. Remember, this is a test of your English skills and your ability to take a test— it is not an indication of your intelligence. So how should you find the right goal number for you? Research the schools that you are most interested and find out what their minimum and what their average TOEFL score is. This is a much better way to plan for a goal that makes sense for you. Also, take a practice test at the very beginning. Even if it takes you a while to reach your score, you can monitor your progress and celebrate when it has gone up, even if it hasn’t reached your target just yet. Just because you are sitting with your book opened does not mean you are studying. The same goes for flipping through flashcards or even taking notes. If you aren’t concentrating, that means you aren’t actually taking any new information in. If you spend hours every night with your study materials, decide if you can condense the amount of time you study by simply studying in a more efficient way. Are you constantly starting and stopping? Do you spend a long time stopping to look up words so you never get to the actual practice? Many people increase the amount of time they spend studying without critically thinking about how they are studying. Think about where you are, what time of day it is, and what your plan looks like before adding more time. Studying with a purpose in a place that works for you at a time when you can really concentrate will ultimately yield better results than just adding more time. Perhaps you decided that the way to succeed on the TOEFL is to learn 250 new words a day. That is an ambitious strategy. You will know over 1500 new words by the end of the week. But will you? If you saw a word in a reading passage on Thursday that was on your vocabulary list from Monday, would you be able to tell me the definition? Probably not. If you don’t build review time into your schedule, the time that you dedicated to learning the vocabulary words might have been wasted. This happens frequently with vocabulary, but other skills need time to develop, too. If you struggle with writing well- developed paragraphs, don’t think that because you read in your book how to do it that you will not be an expert. You need practice, and the practice must be consistent. Do it again and again. Some students are so afraid of the TOEFL that they decide they will take the test “when they are ready” instead of on a specific date. 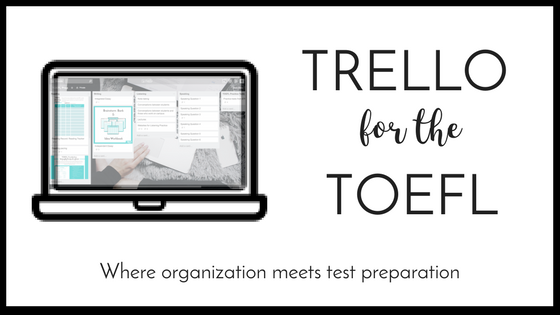 While it is good to keep some flexibility in the early stages of prepping for the test, especially if you are starting with little knowledge of the exam or with a lower English proficiency, you cannot let this uncertainty go on forever. By setting a goal time and registering for the test, you will force yourself to become more serious about studying. Do you have the television on when you study? Or do you listen to your iPod? Are you studying at Starbucks and you keep hearing people place their orders in the background while you try to focus on your reading about new agricultural strategies to use during droughts? Or do you keep getting text messages every time you start writing your essay? We live during a time when multi-tasking is common, but that doesn’t mean that multitasking is good for us. In fact, more and more studies claim that we are dividing our attention, often to our own harm when multitasking. Set aside a reasonable amount of time to study for the test and then entirely unplug during this time. Do not check Facebook or any other social media accounts. Even if you only study for half an hour, dedicate all your effort to studying or taking that practice test. The free app 30/30 allows you to use your phone as a timer in 5-minute increments so you can perfectly time how long you want to do something— and your break time will be timed as well. This is great for students who are taking breaks too often or for too long. Android users might want to look into Stay Focused, another free app that limits your ability to use certain social media and internet functions. There are a number of these types of apps and plug-ins, so find the one that works best for you if you need a little help with your self-control. Now that you know what the problems are, create or revise your study plan to give you a much better chance of success. Want help getting that done? Download the free Plan for Success Study Planner that I created just for you! Thank you! Here is your free Study Planner. Click here! 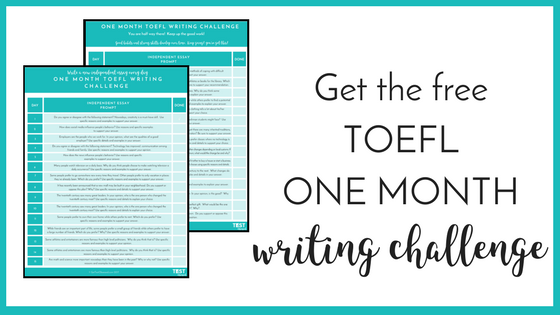 Be sure to check your email for more TOEFL tips and tricks!